Maine has had class III gambling since 2003 and currently allows 2 state-sanctioned casinos to operate within its borders. 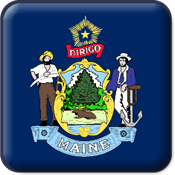 Coupled with slow domestic expansion the Maine online casino market has yet to take off. This puts licensed offshore casinos as the best destination for players from Maine to find viable online casino action. This page was designed to provide information on the casino industry in Maine, how lawmakers are examining a potential domestic online casino market, and what sanctioned casino gambling options are already available. Domestic casino gambling is legal in the state of Maine through licensed, land-based venues. There are no gambling laws in Maine outlining provisions for a state-regulated online casino sector at this time. However, Maine residents can legally use offshore sites as long as they are licensed and regulated since there is no mention of them being illegal in the state laws. The DOJ’s Legal Opinion on the Federal Wire Act clarified that each individual state has the authority to either prohibit or allow domestic online casino and poker sites at their pleasure. As of this writing, the state has not moved forward with any type of legislation addressing Maine online gambling entertainment. At such time as this changes, we will update this section of our guide accordingly. Here we have listed the top rated offshore gambling operators that accept Maine residents. Each of these sites is legally licensed and regulated, and are therefore operating legally within the industry. Licensed offshore casinos offer Maine residents the option of playing their favorite online casino games at their convenience. It is always important to make sure you are playing a licensed offshore casino that has compliance records. Compliance records from gaming regulators correlate that a casino’s games have been tested for fairness based on industry standards. Online casinos offer a plethora of different online bonuses that account holders can use to add to their bankroll. Online bonuses are one of the best perks of playing online and can be very lucrative. While there are many to choose from and bonuses vary from site to site, here are some popular bonuses that can often be found online. Welcome Bonus – A welcome bonus is an offer that is usually only available to new accounts and usually includes a match bonus up to a certain amount. Deposit Bonus – A deposit bonus is a reward where an online casino will usually match your deposit up to a certain percent. Most deposit bonuses are one time only others can be used multiple times over the life of the account. Match Bonus – A match bonus is where an online casino will match an account holders deposit up to a certain percentage. Match bonuses can usually be used more than once and the percentage that the online casino will match is usually lower than that of a deposit, or welcome bonus. What Games Are Available At Licensed Online Casinos? Licensed online casinos offer many different games that can be wagered on. Here are some of the most popular online casino games that are available to play on most reputable licensed online casinos. Do ME Friendly Offshore Casinos Host Live Dealer Games? The offshore casinos listed in this guide host live dealer versions of multiple table games like baccarat and roulette, for example. A live camera feed takes you inside a brick-and-mortar casino location where you can see an actual dealer conducting a game. Players can communicate with the dealer and their opponents through a chat function. How Do I Deposit Funds To Play Casino Games Online? Online casinos offer multiple banking options to their account holders. Every online casino has slightly different banking options so it is important to choose a site that suits your deposit and withdrawal needs. Below are some of the most common banking options that you are likely to find when using reputable offshore casinos. Oxford Casino Hotel is home to nearly 1,000 different slot machines including video slots, reel slots and video poker machines. There are also table games including Blackjack, Craps, Roulette, Mini-Baccarat, Three Card Poker, Ultimate Texas Hold’em, Mississippi Stud, Spanish 21 and Progressive Blackjack. The Hollywood Casino hosts 800 slots, table games, and a live poker room. Has Maine Ever Considered Expanding Their Casino Market? In 2016, the state House voted down a bill that would have introduced a third brick-and-mortar casino. Another bill surfaced the following year, but Maine residents voted down the casino expansion effort on a 83% -17% vote. What About Domestic Online Casinos? Maine has yet to pass a gambling bill that would introduce domestic online casinos. Until state lawmakers put forth a bill, residents can legally use offshore casinos if they are licensed and regulated. Can I Play For Free At Casinos In Maine? The Hollywood Casino in Bangor hosts free play slot action through their website. Since no money is being wagered, this does not violate state-regulated gambling restrictions. Our recommended offshore casino sites also offer free play games to registered users as well. Are There Any Notable Casino Players In Maine? There are no casino legends, but the Oxford Casino has a Winner’s Circle where they promote local winners. Their website displays people who have won upwards of $100,000 in slots or table games. What Is Considered The First Commercial Casino In Maine? The Oxford Casino is widely considered the first mainstream commercial casino in Maine. It first opened back in 2012 and was the first casino to host table games under the new gambling law at the time. How Successful Are Maine Casinos? Maine’s two casino locations set a record revenue of $129.3 million back in 2015.